DRDA Technical Assistant Recruitment 2018: The District Rural Development Agency has published Government Vacancy notification on official website. The DRDA Department wants to recruit 45 Technical Assistants, Computer assistant, Account Assistant, Training & Block Coordinator etc. 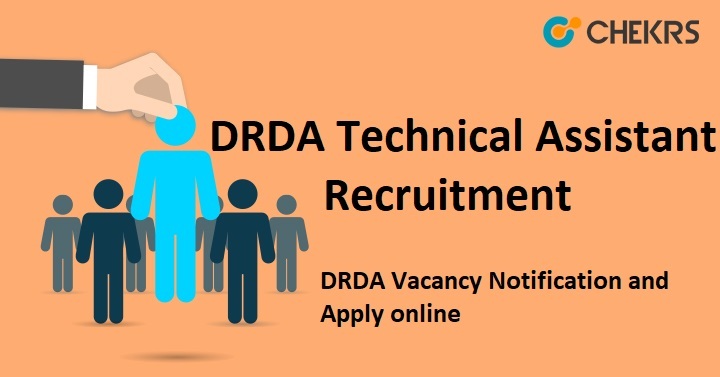 through the DRDA Technical Assistant Recruitment 2018. Here we are providing information about the DRDA Recruitment Notificationsuch as the names of the posts, the number of vacancies, the last date of application, a method of applying for an application form, official website link etc and also check DRDA Accounts Assistant Vacancy. Firstly the candidates go to the official website of http://applyrdd.jharkhand.gov.in. Click on the Current Openings. Choose the Post According your choice. A new window will be open and click on register to Apply Button. Log in with register ID and Password. Remarks: We are providing the latest update related to upcoming DRDA Technical Assistant Recruitment 2018 on our website that is www.jobs.chekrs.com. If you have any query about DRDA Recruitment that you can write comments on commenting box and take a review or feedback.